This image was leaked from an NHL promotional video. 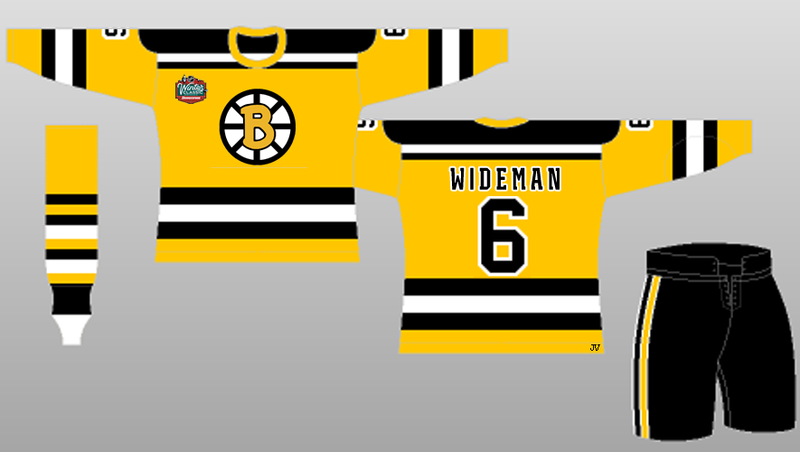 Check out the rendering based on the jersey in Tim Thomas’ bag. Mock-up based on leaked photo. Thanks to Jeff V. for the mockup! This entry was posted on Thursday, September 10th, 2009 at 11:42 pm and is filed under 1, Bruins, NHL. You can follow any responses to this entry through the RSS 2.0 feed. You can leave a response, or trackback from your own site. Thanks for posting the mockup pic! A friend of mine asked for it so he could put it on a forum, so I whipped it up for him. Good to see I wasn’t far off. Thank you Jeff. I’m going to add a credit to you in the body of the post. Had previously just seen it floating around a few boards. Havent you already seen their third jerseys?! The crest is pretty weak looking to me..very animated. I understand the history but I would have much rathered the B circa 1960’s. REALLY happy they decided to go brown and gold though.